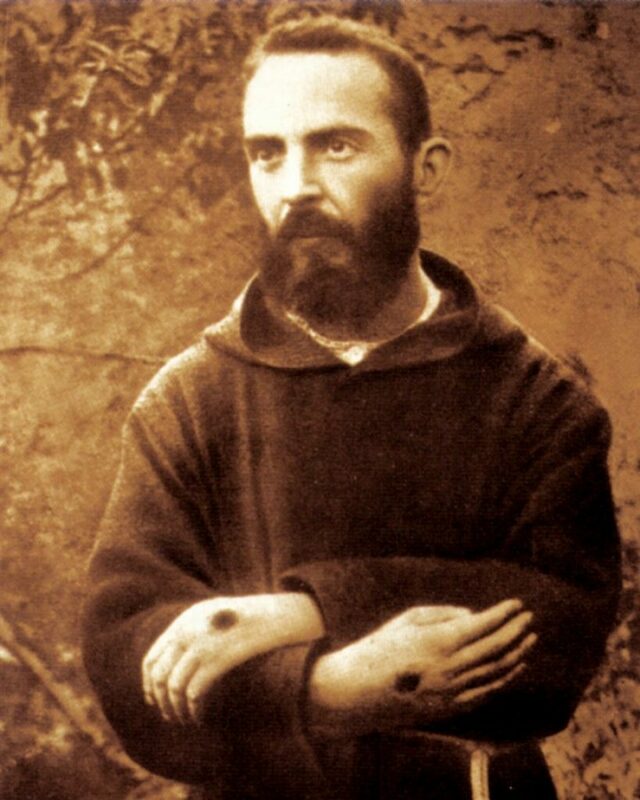 Celebrating the visit of the relics of St Padre Pio to our Parish, we will have a three part series on the mysterious gift of the "stigmata" - the wounds of Christ's Passion that were impressed upon the hands, feet and side of Padre Pio. 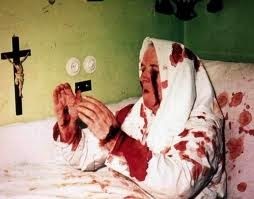 2) Recognize the relation of the "visible" and "invisible" stigmata. 3) Appreciate the basic historical facts and statistics related to the stigmata. II. What does “stigmata” mean? 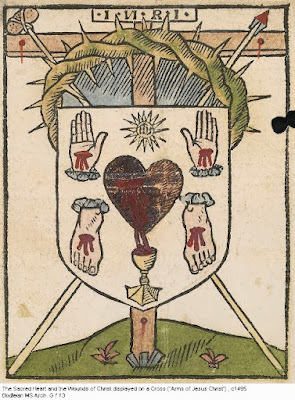 From St Paul, “From henceforth let no man be troublesome to me: for I bear the marks of the Lord Jesus in my body.” (Galatians 6:17) Marks or wounds from the Greek word “stigmata”. While it is most likely that St Paul refers to the wounds and marks he has received for preaching the Gospel (we know that he was scourged, beaten, stoned, shipwrecked, etc), this verse immediately comes to the Catholic mind when considering the mysterious marks or wounds received by certain saints which are patterned upon the Passion of our Lord. A. 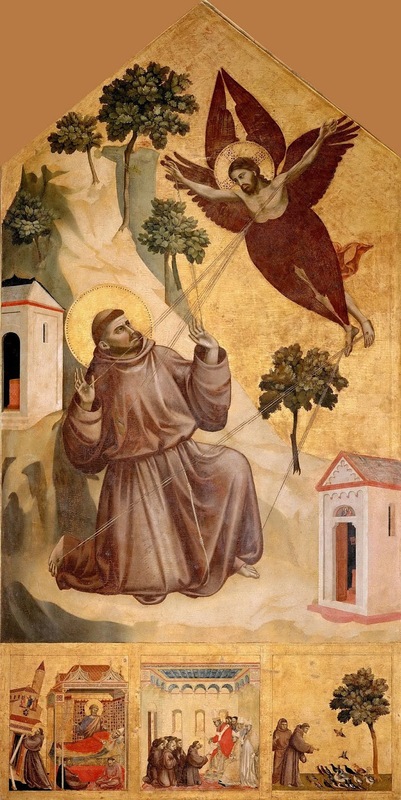 We do not necessarily maintain that St Paul was a “stigmatist” – indeed, Fr Cornelius a Lapide notes that no saint is known to have received the stigmata prior to St Francis of Assisi (and St Paul is never pictured as having the stigmata). B. This verse places the mysterious gift of the stigmata within the context of union with the Passion of Christ and the work of evangelization. St Paul received the marks (stigamata) of Christ in his body through preaching the Gospel and working for the salvation of others. Furthermore, the marks in St Paul’s body are an indication of his union with the suffering Christ – even as Jesus received the wounds for the salvation of the world, so too St Paul carries the cross daily for his salvation and that of the world. C. Nevertheless, there are some theologians and perhaps some mystics who have claimed that St Paul did indeed have the visible gift of the stigmata. III. 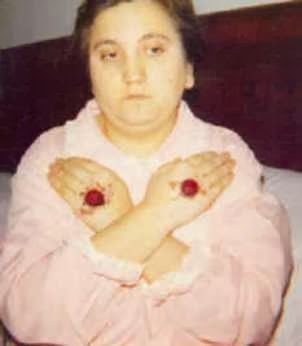 The Visible and Invisible Stigmata: There are many saints who would feel the pains of the Passion of Jesus in various visions and mystical experiences. We can think of St Catharine of Siena as a most famous example – though she regularly felt the pain of the wounds of Christ in the hands, feet, side, and even throughout her body, these wounds were not visibly manifest. A. 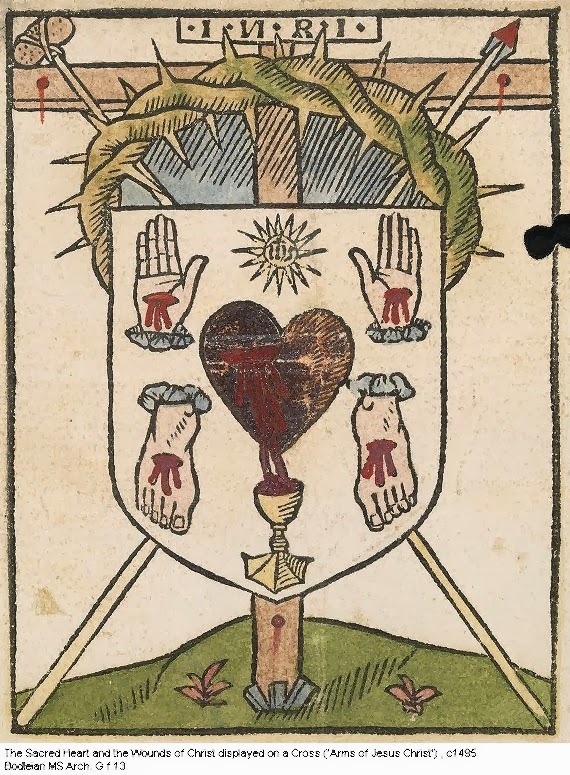 It seems that all the saints who received the gift of the visible stigmata, first experienced the invisible stigmata – or, at least, experienced the invisible stigmata to a greater degree or more frequently than the visible stigmata. Thus, as we will see next week, St Padre Pio had experienced the pains of the stigmata before he received the visible wounds and also experienced more of the pains of the Passion (for example, the scourging and the crowning with thorns) than were visibly manifest. B. While the visible stigmata cause wonder and amazement to the faithful (and even to non-believers), they are a source of great shame to the stigmatist. This is because “shame” comes from the public revelation of that which is private – not “shame” in the negative sense that we think of today (example, shame for sins). However, the invisible stigmata are cherished by the stigmatist but unknown to the world. Thus, the stigmatic saints hide the visible markings from the view of the world, but continue to strive for more perfect union with Christ’s Passion. IV. The Stigmata, Transverberation, and a life of mortification: St Paul presents the stigmata as union with Christ Crucified for the salvation of the world. B. Our Lady of Sorrows (September 15) traditionally speaks of the “Transfixion” of Mary’s Heart – “And thy own soul a sword shall pierce” (St Simeon to Our Lady, Luke 2:35). Mary’s heart was truly pierced as she shared most intimately in the work of the Redeemer. V. The associated mystical experiences: The stimgatics are all visionaries, mystics, ecstatics. Generally also miracle workers. Many have at least periodically the gift of inedia (living only on the Eucharist). A. There have been over 321 cases (perhaps even some 400 cases) of the stigmata which are credible, though the Church never pronounces an official ruling (except, perhaps, in the case of St Francis, since his stigmata were honored in a universal liturgical feast of September 17). 2. If a stigmatist is beatified/canonized this implicitly approves the stigmata, since the saint would otherwise be fraudulent or insane. C. Over 80% of the stigmatists are women. There are some lay people as well. D. The first saint known to have received the stigmata is St Francis of Assisi in 1224, however St Lutgarde was also a stigmatist and she lived at the same time. E. The first priest credibly to receive the stigmata was St Padre Pio in 1918. 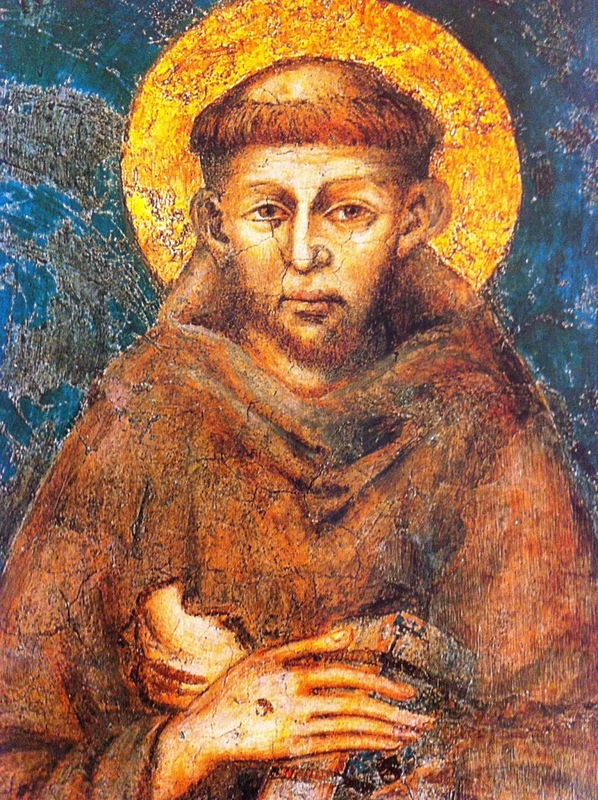 (St Francis was only a deacon). F. There have been many fake stigmatists, and perhaps even some who received stigmatic marks from the devil – Sr Magdalena of the Cross, “The Devil’s Saint” +1560. There have also been non-Catholic Christian stigmatists. Even some non-Christians have claimed to receive mystical wounds (demonic). Scientific inquiry about the stigmata is difficult to assess since it relates to the study of the stigmata in particular individuals, and we know that the stigmata is manifested in a great variety of ways. B. It is unthinkable that saints such as Francis of Assisi, Padre Pio, Gemma Galgani etc would have mocked the Passion by falsifying stigmata. C. Neither can we believe (as many modern sources claim) that the stigmata were a means whereby women could gain power in the Church. 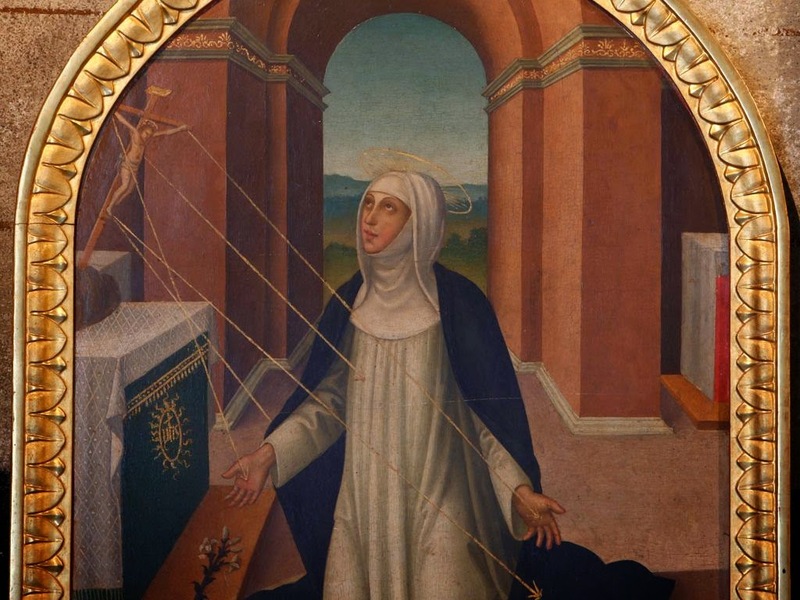 Consider that St Catherine of Siena retained only the invisible stigmata – if any woman needed “power” it was her! Or again, think of the female saints who had the stigmata, were they “powerful”? 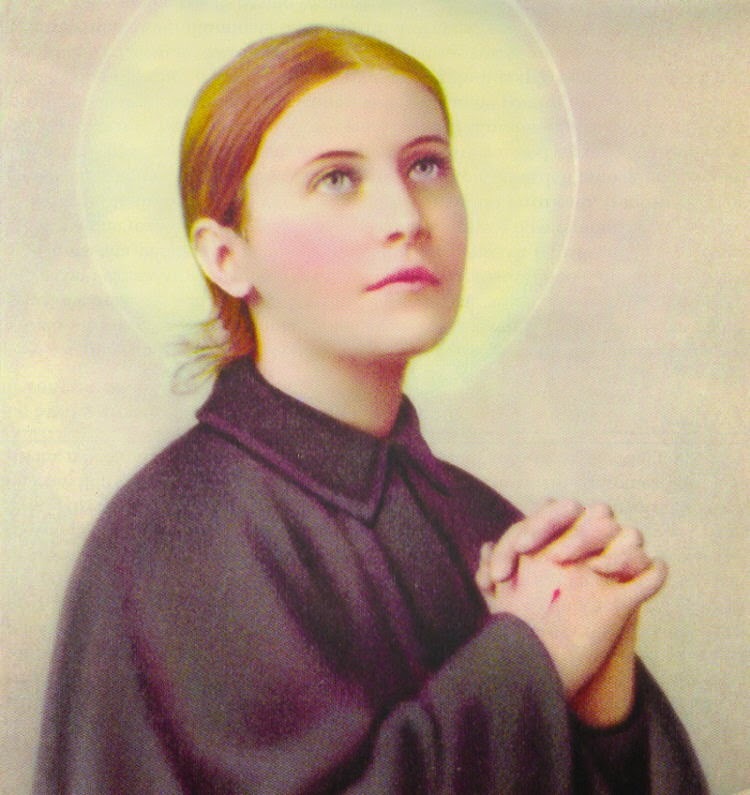 Gemma Galgani, Anne Catherine Emmerich, Rita of Cascia, Frances of Rome, etc. D. No reasonable explanation from psychological suggestion – The wounds are not “created” by the psyche of the mystic. 1) Physicians do not succeed in curing these wounds with remedies. 2) On the other hand, unlike natural wounds of a certain duration, those of stigmatics do not give forth a fetid odour. To this there is known but one exception: St. Rita of Cassia had received on her brow a supernatural wound produced by a thorn detached from the crown of the crucifix. Though this emitted an unbearable odour, there was never any suppuration or morbid alteration of the tissues. 3) Sometimes these wounds give forth perfumes. E. Other details that are reported by some: The blood flows from the wounds in the direction it had flown on the Cross (example: Even though the stigmatist is lying down, the blood flows up and over the toes as though the saint were hanging upon the cross, and likewise with the flow from the hands down the wrists and arms, etc.). 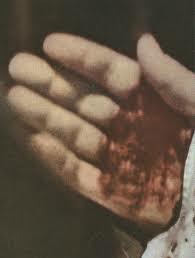 The blood is of the type AB (which matches that of Eucharistic miracles), even though the saint’s blood type is not AB. The saint is said to be without any blood in the body at the time of death (as was Jesus after the piercing of his Heart). These details we cannot confirm as true. VIII. The two most extraordinary stigmatic saints are St Francis of Assisi and St Padre Pio. Unlikely, since they are both men, and female stigmatists outnumber males 7 to 1. Likewise, both were clerics which is exceptional among stigmatics. A. St Francis of Assisi: Because he was first, and also because of the visible nails. 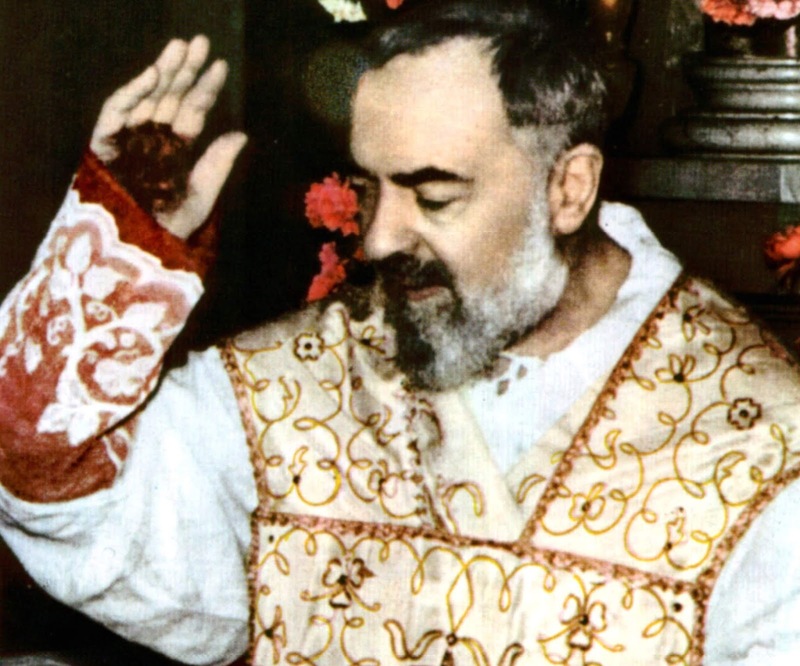 B. St Padre Pio: Because he was the first priest, and because his stigmata remained visible for 50 years and were prominent in many photographs, and were also subject to medical study.